My yarn calls to me. I’m behind in the challenge I’m doing. In the evenings, my hands are too tired and my mind too preoccupied to crochet. During the day, chores, laundry, and cooking call to me and I feel too guilty to do anything to relax. When I’m too busy for the little things, I’m too busy. The moment I stopped having time to crochet, I also stopped having time to read and pray. Funny how things like that go hand in hand. I’ve probably also been a bit grouchier. Posted in Uncategorized and tagged crochet, too busy. Bookmark the permalink. Posted in Uncategorized and tagged failure, truth, Zechariah 3. Bookmark the permalink. Bags are packed. Everyone’s asleep. I’m scouting out menus to find safe resturants and cooking safe travel food. Because you can never take a vacation from food allergies. I’ll be posting food on istagram and sharing tips on the blog this week as I travel with food allergies. Come along for the ride! Posted in Uncategorized and tagged traveling with food allergies. Bookmark the permalink. I’ve read that verse a thousand times. It has penetrated my heart on several occasions. But I often forget the message and live cowering in my weaknesses, hiding them and trying to ignore they are there. A few weeks ago my weaknesses started screaming at me. They wouldn’t be ignored. Instead of allowing Christ be my strength, I faced despair. I felt defeated and walked in that darkness. The enemy won that battle. Because I’m stubborn, it takes awhile for the truths to seep in. Jesus placed some women in my path to dispel the words (LIES) I heard and believed. Then He placed this Bible study written by Priscilla Shirer in my hands (Thank you, Gindi!). He was not struck down by a lightening bolt. God met him where he was. God asked big things of Gideon. God loved him through it. God gave him the encouragement he needed. so I can face my fears, and the things God asks of me. Then, His light shines through my weakness. 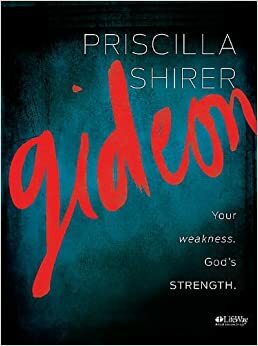 Posted in Uncategorized and tagged Bible study, Gideon, Priscilla Shirer, weakness. Bookmark the permalink.